The latest outing for Dr. Kay Scarpetta is packed with too-close-for-comfort encounters. The murder mystery that the medical examiner tangles with in “Dust” hits close to Scarpetta’s home, her Cambridge Forensic Center office, her technical wizard of a niece, Lucy Farinelli, and her FBI profiler husband, Benton Wesley. Upping the nail-biting suspense factor is the story’s breakneck pace: The action opens on a dark and stormy winter’s night — the eve of Benton’s birthday — doesn’t let up for nearly 500 pages, and largely takes place within a 24-hour period. Still, when a 4 a.m. call from Detective Pete Marino alerts her to a dead woman discovered on a Massachusetts Institute of Technology football field — practically in Scarpetta’s backyard — the medical examiner is on the case. From the start, elements of the murder continue to throw up uneasy connections to various aspects of the ME’s personal and professional life. Even worse, as Benton notes early on, they may be looking at a crime that “someone doesn’t want . . . solved.” Starting with complications that could involve a sinister-sounding financial company called Double S, organized crime, political corruption, a strange fluorescent dust, and a creepy game of rock-paper-scissors, the murder also suggests uncomfortable possible ties to a set of serial murders that Benton is working in Washington. The best-selling crime writer lives on the Boston waterfront and writes in an office nearby overlooking the harbor. The usual dynamics apply: Scarpetta’s team’s razor-sharp, in-office forensic investigations; Lucy’s sometimes-questionable ethics; and Scarpetta’s aggressive-yet-intimate exchanges with Marino, her former lead investigator who’s newly back on the police force and determined to put their professional relationship back on an even keel (or, as he keeps reminding her, she’s no longer the boss of him). On the slightly lighter side, there are squabbles between Scarpetta and Lucy over who spoils their dog more and a sarcastic dig at the too-easy danger of grabbing headlines off the Internet. 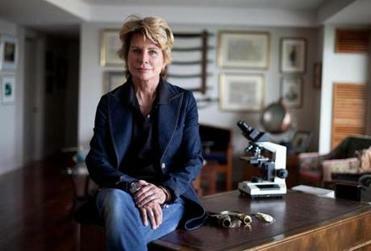 Overall, Scarpetta’s 21st outing provides the standard — read excellent — Patricia Cornwell fare, plus a real-world-related tidbit: “Dust” contains an element of what the author has succinctly described as “vengeful anger” targeted at her onetime financial advisers, partly by giving Cornwell’s characters free rein when it comes to venting about the sleaziest and most vicious aspects of so-called “money management.” Hell hath no fury indeed. Daneet Steffens is a journalist and book critic. Follow her on Twitter @daneetsteffens.